After almost a year trying to locate this scene it has finally been spotted. It occurs in "The Peacemaker". 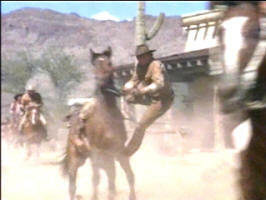 Don Collier had mentioned some time ago that his "flying Sam" dismount in one of the episodes was no fluke. 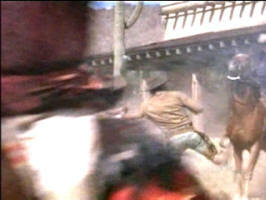 For years, fans have thought it was either a trick shot or it was a stunt double, but Don said it was a natural dismount when coming out of the saddle at the end of a full gallop, that the momentum created by the sudden stop will spin you around, and it looks like you are doing a 360 degree turn. 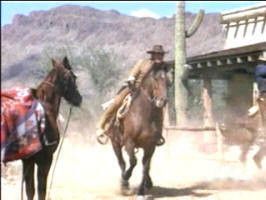 His horse was very well-trained, and when it planted its front feet, it did not move. 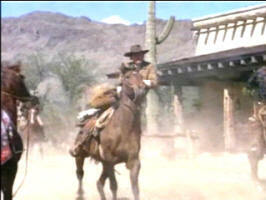 Don said they practiced that scene 3 times and each time, he did the exact same dismount. 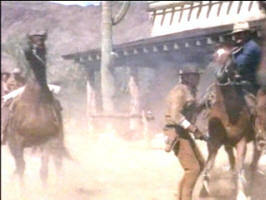 It happens near the end of the episode when the Bunkhouse Boys are out on the range and hear the Apaches attacking the ranch. 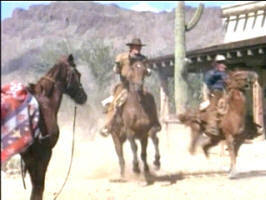 They all come riding in the back gate at full gallop, with Sam and Joe in the lead. 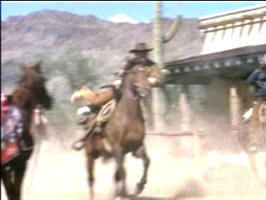 The two dismount almost simultaneously, with Don doing his full spin and nearly colliding with Bob as he spins out of his saddle. 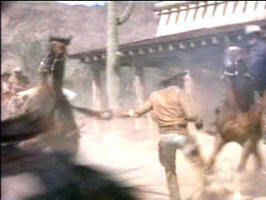 Unfortunately, part of Don's dismount is obscured by an Indian pony in the foreground, but it is still very good. Watch for it next time you see this episode. 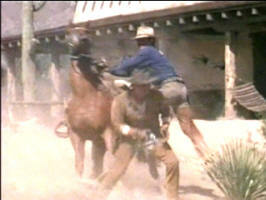 as Sam's horse prepares to plant. Sam's horse plants just ahead of Joe's as Sam starts his dismount. 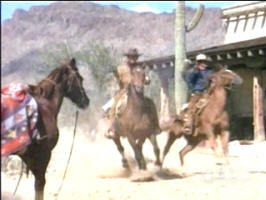 With the forward momentum carrying him, Sam swings out of the saddle to face backward. 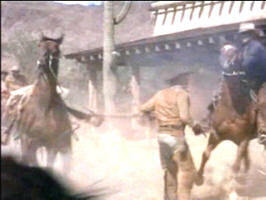 coming up to face Joe's horse as Joe begins his dismount. 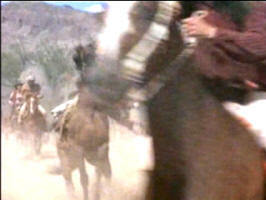 behind another passing Indian pony. 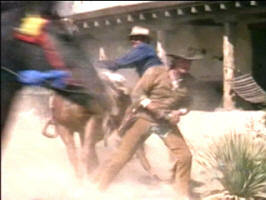 but it appears that he turns back to his left rather than following through with a full spin like Sam's.